Regina Audi specials | Taylor Audi Regina Audi Dealer SK. 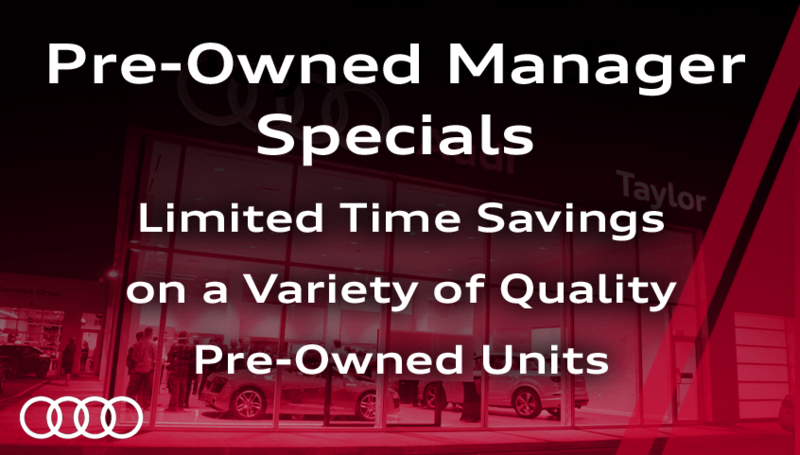 Click the Link below to check out our list of Pre-Owned units that Pre-Owned Sales Manager NEEDS TO GO! Hurry in today - these won't last! For a limited time here at Taylor Audi, simply present this coupon via print or own your mobile device to receive $500 off any extended warranty with the purchase of ANY new OR used vehicle at Taylor Audi! Get an additional piece of mind for an even lower price. Win win. Disclaimer: No cash value. Must present coupon prior to signing off on deal in order to receive discount. This offer may end at any time without notice.